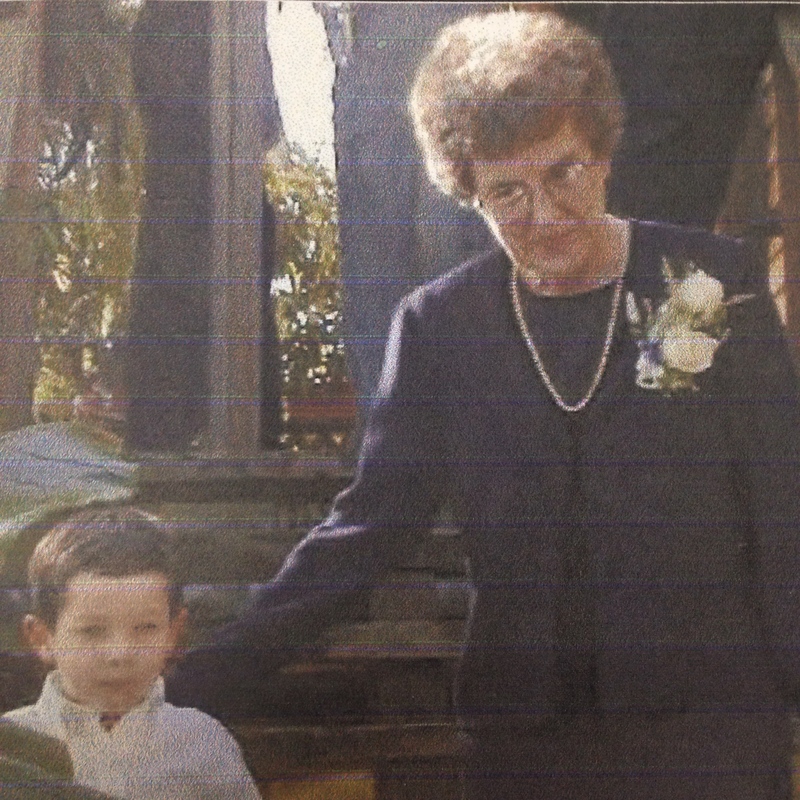 Martha Boudreaux walking with Ben down the steps at Wanda’s backyard wedding. This recipe is as close to my mom’s that I can approximate, both Monique and I agreed that with a few subtle changes this base recipe would be the same one-pot meal that came out of Martha Boudreaux’s kitchen in Algiers, in the New Orleans Westbank. Similar to the Southern favorite Hoppin’ John, with the addition of the black-eye peas, this jambalaya version is packed full of flavor with a rice dressing or dirty rice quality that makes us come back for seconds, or thirds! 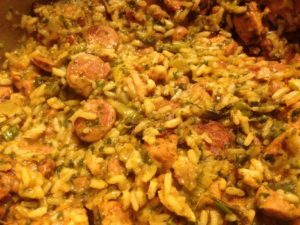 The fresh parsley and green onions added at the end lend a freshness to the dish, setting it apart from a general jambalaya recipe. In memory of my mother and her recent passing, Martha Boudreaux’s kitchen legacy lives on with this dish prepared in our kitchen, and yours too, as I share with you our rendition of this classic recipe. 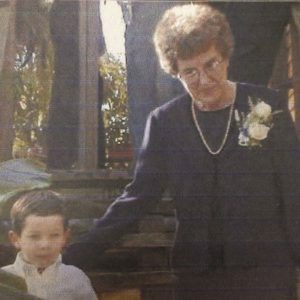 While downsizing and sorting through boxes I found the photo (above) of my mom Martha Boudreaux, and our son Ben which was taken during my sister Wanda’s wedding which took place in her backyard on Farragut Street in Algiers many years ago. In a heavy 4-quart Dutch oven or pot over medium-low heat, add the bacon grease or oil, season the pork with the rub or Cajun Seasoning, then brown it and the sausage until all pink is gone from the pork. Add the onions, pepper, celery and garlic, stir well then cover and allow to simmer down for 15-20 minutes. Add the chicken stock and Worcestershire sauce, turn up the heat and bring to a boil. Add the rice and black-eye peas, stir well, bring back to a simmer, then turn down heat and cook for 20-25 minutes, or until rice is tender and has absorbed all the liquid. Season to taste and stir in the parsley and green onion, keep covered for another 10 minutes then serve. I’m sorry to hear about the loss of your mother. Somehow, I forgot that your mother and your sister have the same names as my mother and my sister. That jambalaya looks mighty good! Hey Greg, Thank you so much, we’ve been remembering and reviving recipes from her kitchen that we all loved.